Of all the questions I get from most readers, most of them are from women looking to stay safe on their travels. We live in a world where women are constantly told, No, you can’t travel, it’s not safe, most often from people who are well-meaning but misinformed. That’s why I write this site. It’s my job to keep you informed of what travel is actually like. 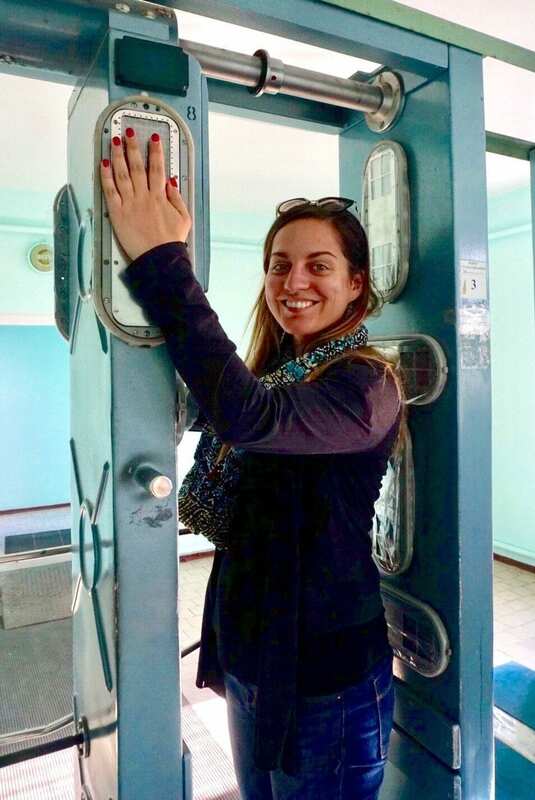 Yes — it’s very possible for women to travel the world safely and independently. And one way to stay safe is to protect your belongings when in transit, especially your passport. 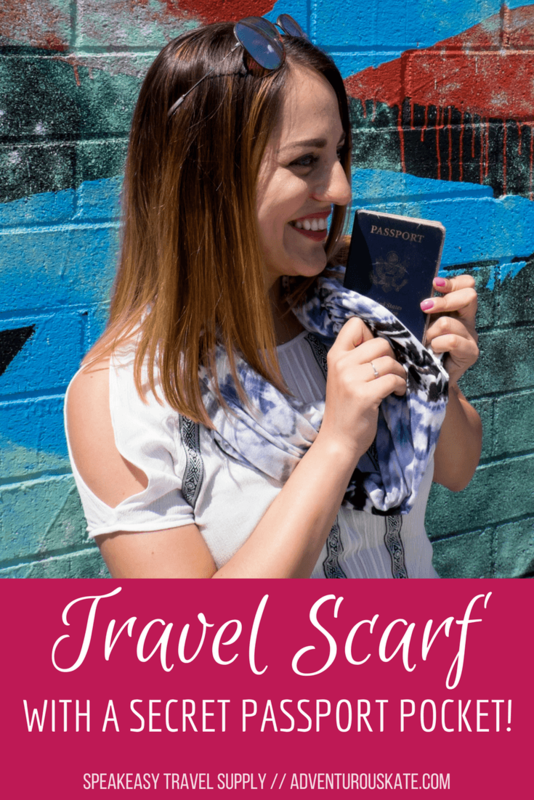 Thanks to a business started by my friend, I am protecting my passport in the most stylish way possible: with a Speakeasy Travel Supply scarf. And now I’m introducing two new Speakeasy scarves in the Adventurous Kate collection — plus a 10% off code for AK readers! Read on for the details. My friend Bethany Salvon started Speakeasy Travel Supply four years ago. She was frustrated with how few pockets there are in women’s clothing and wondered how she could make her travels easier. What if there were a pocket in a scarf? She wore scarves all the time anyway! She sewed an infinity scarf with a pocket in it and it worked so well, she and her partner Randy decided to start selling them. Today all Speakeasy scarves feature a double-stitched pocket for maximum durability and have a hidden, self-locking zipper. There are light, airier scarves for spring and summer and cozy, heavier scarves for fall and winter. Above all, Beth’s goal was to create a product of high quality. “When you come back to buy another scarf from us we want it to be because you want a new color or design, not because your other scarf stopped working.” You can read more about how they’re made here. And then Buzzfeed came calling! Buzzfeed listed Speakeasy scarves as an item “every traveler wishes they owned.” That set off a deluge of media coverage. 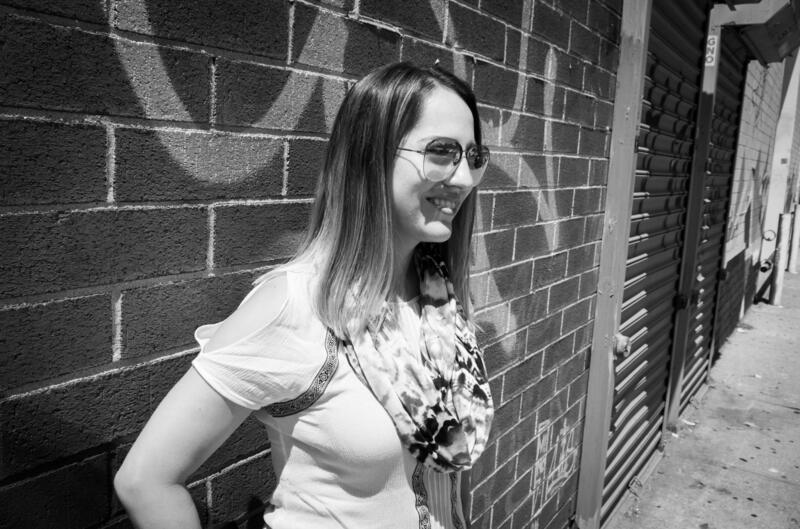 Today Beth has gone from a full-time travel blogger at BeersAndBeans.com to a full-time scarf entrepreneur. All of the scarves are made in her home in Massachusetts — high quality and economically sustainable with zero reliance on sweatshops. And I couldn’t be happier for her. It’s so hard to make a living as a travel blogger, so to springboard from blogging into a related but very different business is such a gift! 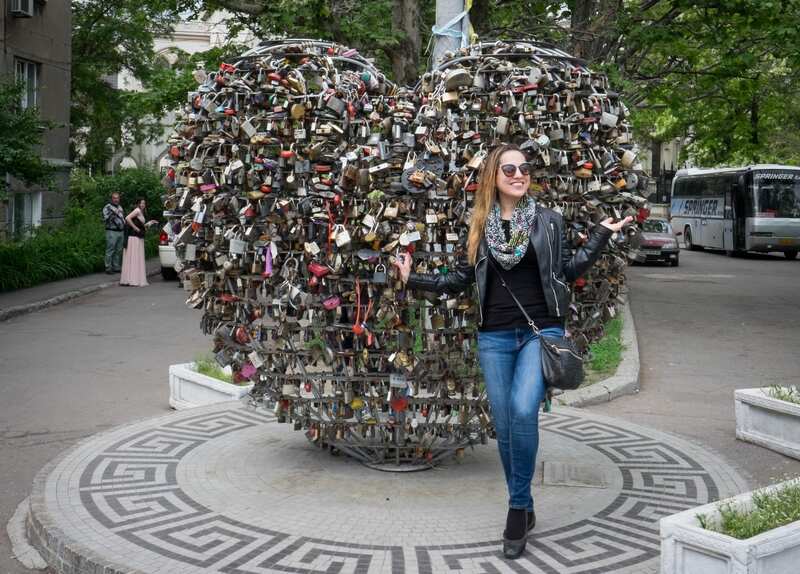 Many travel professionals encourage the use of money belts, but they aren’t as practical for women as they are for men. Why? Moneybelts are pointless when worn under dresses! Additionally, I don’t like how moneybelts feel, I don’t like the constant sweaty feeling on your waist, and most importantly, thieves know all about them. A skilled pickpocket knows exactly where to cut a moneybelt. With a Speakeasy scarf, it’s something that you actually want to wear (and it’s something that I do wear on its own, even when I’m at home). And thieves have not caught on to them yet. If you use them for their intended purpose — storing your passport or valuables — nobody is going to have a clue you have anything in there. Believe me, thieves don’t go around accosting every woman with a scarf around her neck. Scarves are seen as scarves. Well, they’re so beautiful and fashionable that you could wear them anytime, but there are some situations when they are especially helpful. I use mine when in transit between countries. When traveling by bus, sometimes I have to take my passport out a few different times. Keeping it around my neck keeps it close to me. I use it when in between accommodation. If I need to check out by 10 AM and can’t get to my next accommodation until later, I’ll keep my passport in there rather than leaving it in the hotel’s luggage storage room. They are awesome for festivals. At festivals you want to be carrying as little as possible, and these scarves help you do that. They work well for sporting events. At sporting events you don’t have a lot of space for your stuff, especially somewhere with tiny seats like Fenway Park, and these scarves give you much-needed storage. It was ideal for Chernobyl! On my day trip to Chernobyl I had to keep my passport handy for different checkpoints, so I just kept it in my Speakeasy scarf and wore it all day. That’s me at Chernobyl in the photo below, getting my radiation levels checked on the way out of the contaminated zone. How Much Can You Fit Inside It? Generally, I prefer to just put a passport or light things inside it, but if you wanted to, you could fit more. If you were determined, you could fit your passport, a small wallet or moneyclip, your phone, lipstick, and keys. 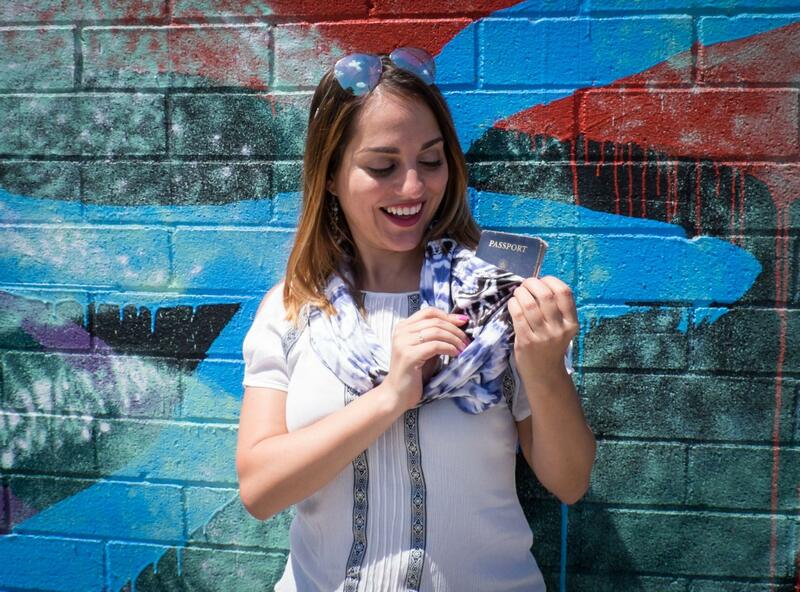 Yes, this scarf could potentially replace your whole purse. And, um, you could totally fit a flask inside it. Just saying. I’m proud to be partnering with Speakeasy Travel Supply and introducing not one but two scarves in the Adventurous Kate collection! (I’ve never had a collection named after me before…this is SO cool!) I chose these two scarves myself and I hope you like them as much as I do. First, the Adventurous Kate Scarf is exactly my style. Black with a touch of bright colors is pretty much all I wear! This scarf is 100% rayon and it’s light, making it a perfect style for spring, summer, and fall. I love it paired with my uniform: distressed skinny jeans, tall black boots, a black top, a faux leather motorcycle jacket, and designer shades. Note: QUANTITIES ARE LIMITED of this one in particular. If you want it, I urge you to snap it up ASAP. Second is the Adventurous Kate Melbourne Scarf. If you’ve been to Melbourne, Australia, you know two things: it’s an extremely cool city and you often get four seasons of weather in a single day. 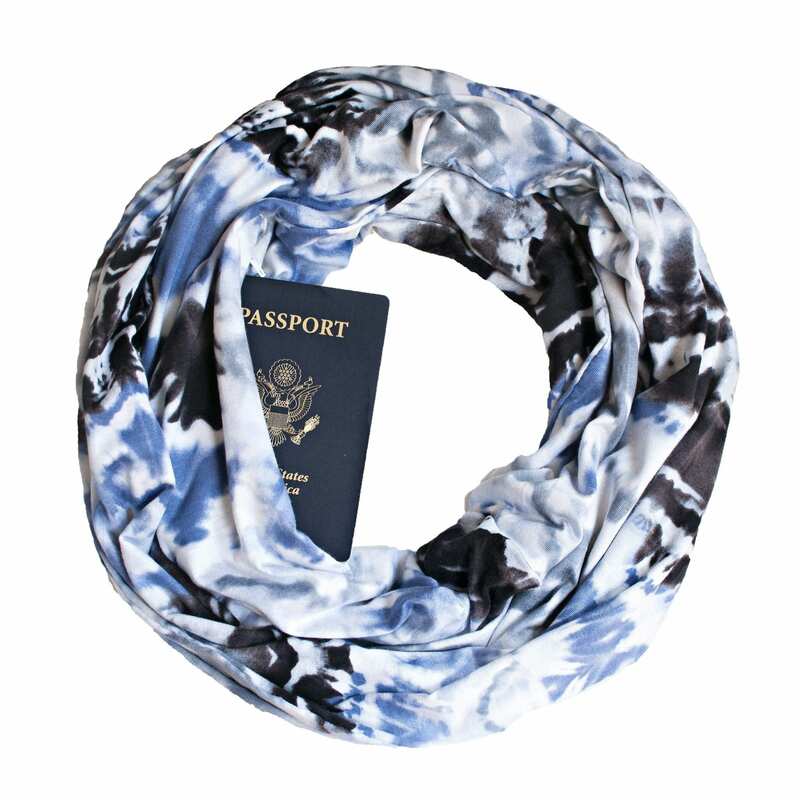 Not only does this scarf evoke the wild weather in its blue-white-gray tie-dye pattern, it’s made of super-soft and stretchy jersey fabric, which is warm in the winter, cool in the summer, and ideal for sleeping on when you’re in transit overnight! Pair this one with jeans and a light-colored top, or a jean jacket. It would make me so happy to see these scarves on you. If you have a traveler in your life with a birthday coming up, this makes a perfect gift. It’s fashionable and it’s thoughtful. In fact, I bought one for my sister for Christmas last year. And there are way more than just girly styles! There are plenty of more neutral and masculine styles available throughout the site as well. You’ll see Randy modeling several of them on the site. There are scarves for Southeast Asia and scarves for Antarctica. 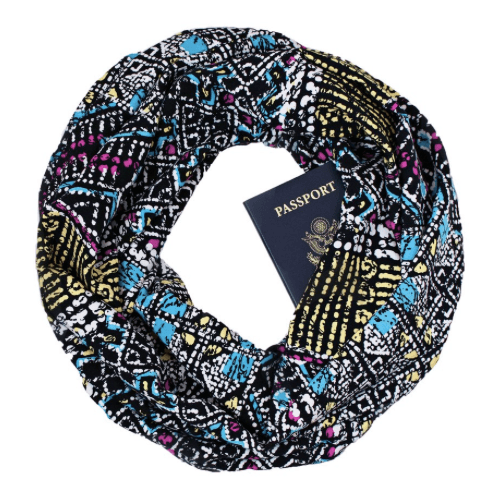 The scarves come in a variety of fabrics, so you can find one that fits the weather of your travel destination. The more you buy, the more you save. If you buy two scarves, you’ll save $8; if you buy four scarves, you’ll save $20! And you can also save $5 by signing up for the newsletter. And there’s free priority shipping in the US and Canada if you spend more than $75. Adventurous Kate readers get 10% off! Get 10% off any order with the code ADVKATE. Essential Info: You can peruse the Speakeasy Travel Supply here. The Adventurous Kate Scarf and Adventurous Kate Melbourne Scarf each cost $55, but you get discounts when you buy more than one. Quantities of the Adventurous Kate Scarf are limited — it’s going to sell out quickly, so get on it! Adventurous Kate readers get 10% off their orders with the code ADVKATE. This post is part of a partnership between myself and Speakeasy Travel Supply. Beth sent me these two scarves as a gift and I earn a commission on the scarves I sell. 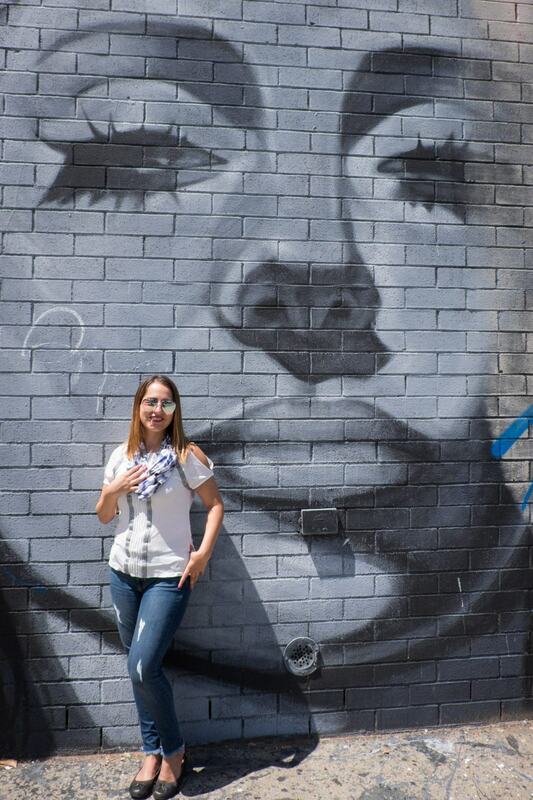 Special thanks to Dani of Globetrotter Girls for taking the photos of me for this post! They were taken in Williamsburg, Brooklyn. Would you wear a scarf like this?